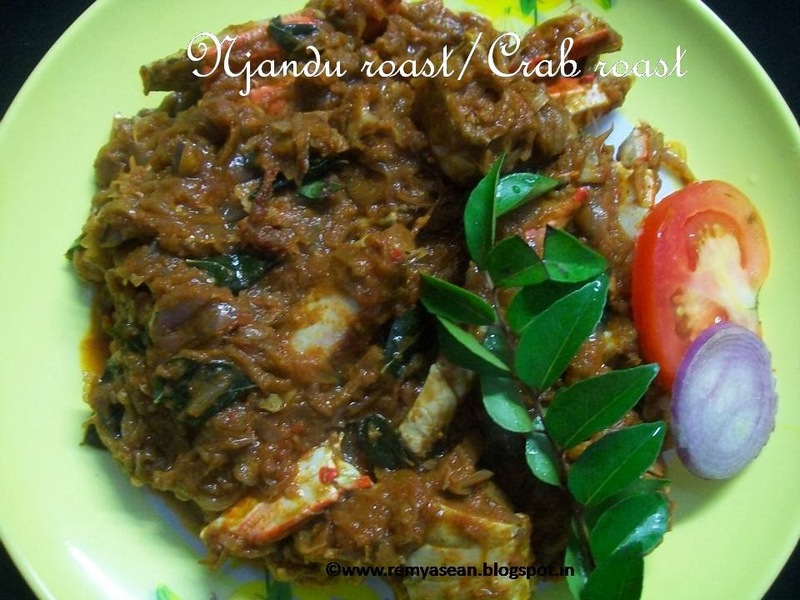 It is a super delicious dish.You can add coconut milk to this dish.It will give more richness and a different taste.I will try crab recipes with lots of variations .This time I'm sharing a spicy crab roast recipe. Cut the crab from the centre and detach the legs. Then clean the pieces well in water with salt and turmeric powder. Cook it in water for few minutes with salt, turmeric powder and little chilly powder.Don't dry it.Keep aside. Make ginger garlic paste by grinding both together. Add onion and saute it well till it turns golden brown colour. Add tomato and saute it again.Add curry leaves too. Add ginger and garlic paste.Stir it well till it leaves the raw smell. Add chilly powder,coriander powder,garam masala powder,fennel powder and salt(be careful while adding salt.Because already we added salt in crab while cooking). Add cooked crab with the water .You can adjust the gravy with 1/4 cup of water..Stir it well for few minutes.Once it mix well with the gravy, add curry leaves and 1tspn oil. Yummy crab roast is ready. I want to have this right now...looks mouthwatering dear..
Gosh, I feel like biting into the crabs pieces. Lovely coated over. 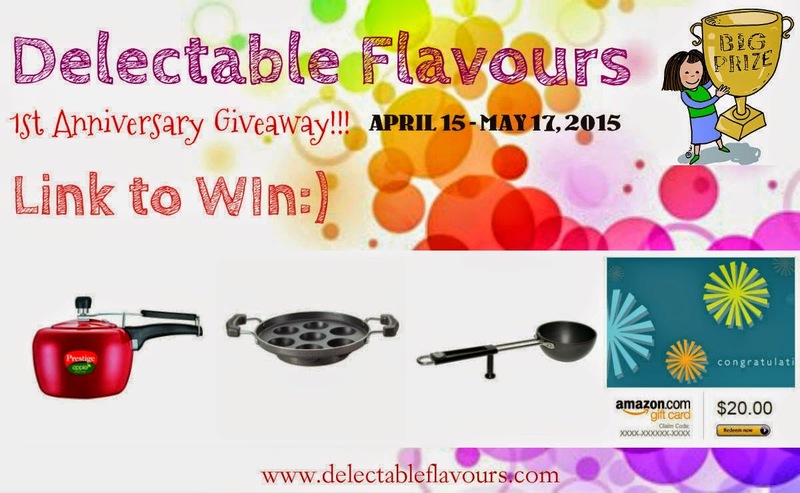 Super tasty and yummy recipe! 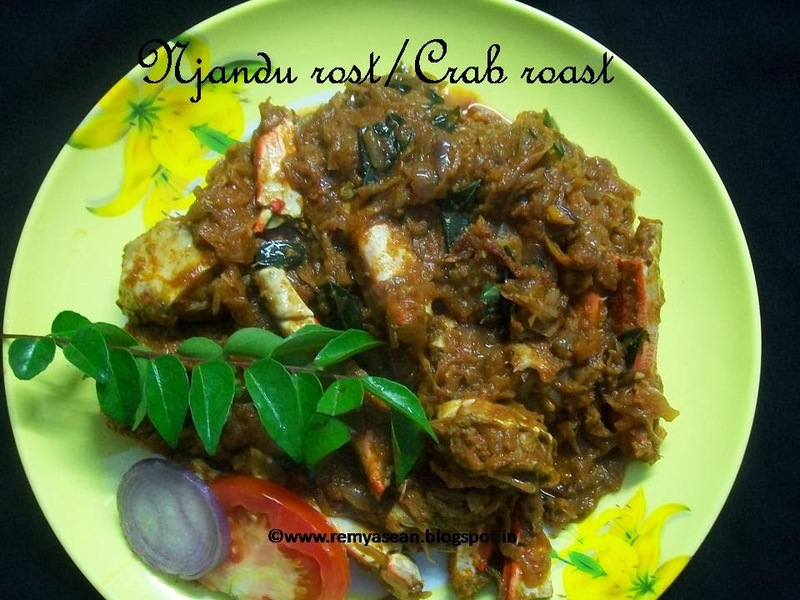 Njandu Roast looks yummy and delicious Remya..